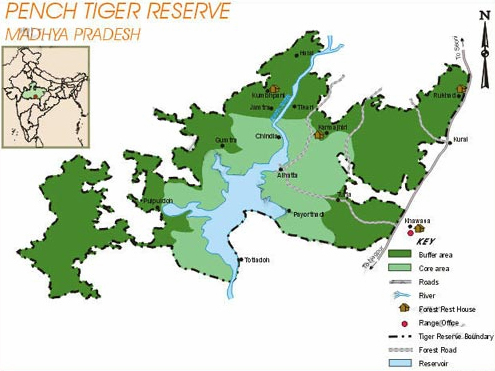 The flow of Pench river stops in December, what remains are a few scenic and serene pools in the river bed. There are a few perennial springs and tanks. At the southern boundary of park, the Pench river has been dammed for Pench hydroelectic project at Totladoh. At the maximum capacity the reservoir submerges 54 sq kms of the park area. This had been the loss of best valley forest, which was once referred by Sir Rudyard Kipling in his book named "Jungle Book". This large reservoir of Pench with sporadic islands attract a number of winter birds from north. Cheetal, SamBAR, Neelgai are commonly seen grazing on the open sites on roadsides and banks of river & reservoir. Jackals can be seen in search of food anywhere in park . Packs of wild dogs can also be seen occasionally . Herds of Gaur can be spotted near streams and bamboo patches, more common during summer months. Heaven's Garden is a Luxury Resort in Pench tiger reserve. Provides modern facilities and amenity. The camp encloses Open Garden with Air conditioned Super Deluxe Cottages both Air cooled rooms as well. Presenting Super Luxurious Jungle Camp situated in the heart of Pench, the " Tiger Corridor" the ultra new & chic luxurious destination for the royal experience amidst wildlife. Mowgli's Den Wildlife Resort offers 10 executive styled spacious rooms with modern amenities. The uniquely designed large bathrooms are a comfort you never forget. 12 Deluxe safari style canvas tents housed on permanent foundation with equipped with showers and tiled bathrooms. Each spacious tent can easily accommodate an extra bed.